end-to-end IT solution at the lowest TCO. The Eurotech Private Cloud Express service is delivered to the client as a datacentre appliance, pre-configured and ready to run. It comes with Nutanix’s Acropolis Hypervisor, which delivers all of the core functionality of VMware or Hyper-V but is tightly integrated with Nutanix’s PRISM management interface to allow for true single-pane-of-glass management operations. The monthly service cost includes basic integration into the customer’s existing network environment (minimum 12 month service term applies). Enhanced services for advanced integration and/or data migration are optional extras. No software licenses for guest operating systems are included but Eurotech can supply these at an additional cost if needed. 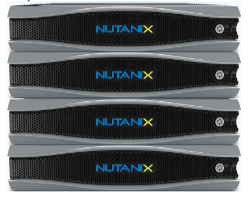 Any software updates or hardware replacement of the Nutanix component of the solution are included for the lifetime of the solution. Additionally, the platform can be delivered as a fully managed service at an additional monthly cost.